A passing score on the National Clinical Mental Health Counseling Examination (NCMHCE) is required for licensure in some states. It is one of the requirements for both the National Certified Counselor (NCC) and Certified Clinical Mental Health Counselor (CCMHC) certification. Successful completion of the exam and certification demonstrates your commitment to the profession and dedication to continued learning within the field. The scenario will set up the stage for your responses in the respective sections. It will provide you with basic, pertinent client information, such as how old they are, whether they are male or female and what problems they are presenting with. You may be given multiple options and asked to make a selection. Be sure to read all options before responding and select all relevant responses by clicking the circle next to them and hitting the “submit” button. Your final IG score will be negatively affected if you submit too many or too few options for the question. The DM section will ask you to make clinical judgements or decisions based on that information you have been given. Single Best Option where you will need to choose the most acceptable response, even though there may be more than one acceptable option. Multiple Options where several responses will be appropriate. A combination of actions will be required for the decisions being made in these questions. You may encounter either of these question formats in the DM section. For “Single Best Option” you will want to choose the most appropriate response out of the given options. The examination may sometimes ask you to make another selection, but this does not mean your previous selection was incorrect. For “Multiple Options” you will be instructed to select as many responses as indicted. For these questions you will mark a circle next to the response(s) before clicking the “submit” button. 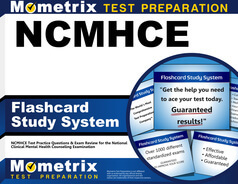 To familiarize yourself with the exam format, we recommend taking the Mometrix NCMHCE practice exam. This practice exam will present itself as if it were the actual examination, allowing you to become comfortable navigating the exam and responding to questions. How is the NCMHCE scored? Each section of the exam has a minimum number of points that are needed to be considered as passing. The points for each section are tallied and you are given a raw score for the entire exam. How much does it cost to take the NCMHCE? To register to take the NCMHCE, you will be required to pay $275. This fee is nontransferable and nonrefundable. What is NCMHCE stand for? NCMHCE stands for National Clinical Mental Health Counseling Examination. What is the NCMHCE exam? The NCMHCE exam is a national certification that is required for those who wish to become a Certified Clinical Mental Health Counselor. Is the NCMHCE exam all multiple choice? 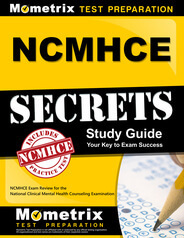 The NCMHCE exam contains 200 multiple-choice questions. How long do you have to take the NCMHCE? The NCMHCE exam is timed for 3 hours and 15 minutes. How do you sign up for the NCMHCE? When you decide to register for the examination, you may do so either online (the preferred method) or via a paper registration form. You will be required to pay a fee for the registration, either online with a credit card or with a cashier’s check or money order with a paper registration. These fees are not refundable or transferable and do expire if the NCMHCE exam registration process has not been completed within one year’s time. Once you have completed the registration process, you will have six months to take the examination or you forfeit both the registration and fees. If you do not successfully pass the exam, you may register to test again after a three-month waiting period. You will be required to pay the associated fees each time you register. You may schedule a testing date to take the MCMHCE exam after you have successfully completed the registration process. Your candidate ID number will be sent via e-mail. This number will be needed in order for you to schedule an appointment to take the exam either through online scheduling (preferred) or on the telephone. You will be asked to confirm your chosen location, date and time for your examination, in addition to being given a time you will be expected to report to the testing center on test day. Take note of this time. You will not receive any further communications from the test administrators or testing location leading up to your appointment. You may reschedule your appointment any time up to 24 hours prior. However, there will be a $50 fee to reschedule your appointment if you do so within 7 days of the originally scheduled appointment. In the event that you need or plan to reschedule your appointment but fail to do so at least 24 hours before your scheduled time, arrive more than 15 minutes late for your appointment or fail to report to your designated testing center at your scheduled appointment time for any reason, you will forfeit both your registration and paid fees. To reregister for the examination, you will be required to submit a separate registration and fees. If the examination needs to be rescheduled due to inclement weather, an emergency or power outage, you will be notified by e-mail or telephone with rescheduling procedures. Cancellation is up to the discretion of the respective testing centers and is usually determined based on whether testing center personnel are able to open the facility. In the event of a power failure in the middle of an exam administration, you will be able to restart the exam where you left off before the interruption. You may register to take the NCMHCE exam at any of the 250+ testing centers throughout the United States. Testing dates are typically available in the first two weeks of every month on a first-come-first-served basis without application deadlines, though available testing dates and times will be indicated when you go to register for the examination. Exceptions include recognized holidays. As you prepare to take the NCMHCE exam, choose appropriate study materials, such as an NCMHCE study guide, that will help you review topics old materials as well as learn new materials. Keep in mind that your main objective is to receive a passing score to achieve licensure. Temporary identification, including employment and student ID cards, are not acceptable. After confirming your identity, you will be directed to a testing carrel. When you begin the examination, you will first be required to agree to the terms of the nondisclosure agreement (NDA) before proceeding to take the NCMHCE examination. It is important to note that you may not bring any personal items into the testing room with you, including cell phones or cameras, and no testing materials may leave the testing location as all questions are copyrighted. All testing materials must be returned to the proctor upon completion of the exam or you will not receive your score report. The Scenario Window on the left side of the screen displays the simulation you are currently working on. The Options Window on the right side of the screen displays the IG or DM section you are currently working in. This window will also include instructions, such as how many responses you are to choose. Once you have submitted a response, you cannot unselect it as your submission reveals information about that selection. To review previous sections and feedback for responses, go to the top right-hand portion of your testing screen. Here, you will be able to view a review screen of your progress on the current case. Upon successful completion of the examination you will be able to receive an unofficial score report from the exam proctor which will indicate a pass or fail. Scores are determined solely based upon the individual’s performance on the exam and are not compared to or influenced by the performance of other candidates. You will need to receive a passing score for both the Information Gathering and Decision Making sections. Passing scores and additional requirements for licensure are determined by the State Board, so be sure to verify what requirements you will need to meet prior to beginning the registration process. Passing scores will be send to your state licensure board within 30 days. If you do not pass the exam, you may take it again after a three month waiting period. Our customers love the tutorial videos from Mometrix Academy that we have incorporated into our NCMHCE test study guide. The NCMHCE study guide reviews below are examples of customer experiences. I like how everything is condensed in to easy chunks so that I can stop just about anywhere, put a sticky note in place, and pick right up when I next pick up the book. I especially like how the answers are rated and explained so that I can think about the answers and how they relate to the scenarios. Several other sites and books I first looked at had the rating, but no explanation. Having been in the field almost 2 years before taking the test, I like that I can take what I read and apply it to personal experience in the field. I enjoy studying from “book material” than being on the computer for hours studying. I can also make notes in the book for further thought and follow up. The material is very informative and understandable with the breakdown of the diagnosis and assessment. With the practice questions, I can take them repeatedly and learn from my mistakes with the explanation of each choice given. I wish I had this in grad school to help review for tests. Each section has great information covering the major areas needed to study while avoiding unnecessary repetition or time consuming transitional paragraphs. It hits fast and it hits hard. I love it and will recommend it to all who have the NCMHCE in their future. The product was good for me because I was able to see questions that are similar to the exam. I am a visual person, so been able to practice and see the questions, give me a better insight for my studying. It’s easy to read, has great simulations, and I’m sure it will help me pass the test. I especially appreciated the “Specific Issues” section which reinforced my knowledge on Career Counseling. It is very easy to understand and is full of important information that can be used on the test. It is easy for me to maneuver and understand the wordings and the information presented in the book. I am enjoying using it as a reference to my upcoming test. I feel that it is very thorough and helpful. One of the most useful features is the practice vignette section that is in the book that allows you to practice for the test. I think that this will be very helpful in helping me pass the NCMHCE. Well written! Concise and to the point with no fluff to plow through! I have purchase other study guides and they pale in comparison! Would have saved a lot of money if I had invested in Mometrix first! I purchased this item in particular because of it’s volume of information, clarity and practice exams. So far, it has become my go-to resource for studying and has proven to be beneficial for me.